Top mounts are special order only. Please contact our dealer for schedule of availability. 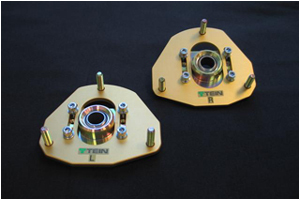 TEIN's pillow ball (spherical bearing) upper mount is designed for each individual model of the vehicle. By remaining the positioning design of upper spring and shock absorber close to manufacture's standards, TEIN's pillow ball upper mount keeps height change to the minimum and maintains the stroke center. The rubber bush is replaced with a pillow ball which eliminates the load input compliance, reduces the change of alignment to improve the grip of the tire. *NMB's (The world's top spherical bearing manufacture) pillow ball is used. Ultra duralumin A2017S-T4 (aircraft material) is used for upper seats and adjusting plates with anodized aluminum to have maximum strength and durability. For the Mcpherson strut suspension(only for front) models, the camber angle is adjustable. This creates wide varieties of different suspension settings according to the road and tire conditions. High tension material S45C is used for serration bolts. As it is already inserted with high press, installation time has been completely reduced. With the original long bolt design, it can be easily mounted and gives enough thread for the strut tower bar to be fitted. *1: Rr pillow upper mount possible to put on individual type spring seat. *2: If you install for non-TEIN dampers (incl OEM). You must order x2 additional M12-Pillow Nut.